The Middle School staff celebrated the completion of training last Thursday. They spent the day learning improved practices to measure student progress. who were suffering from illnesses. Way to lead the way, NVES staff! NVHS September Students of the Month are (not listed in correct order): Marco Corona-Vega, Carter Young, Krista Freeze, Dawson Mathes, Skyler Orr, Dylan Roberts, Xander Hires, Cristabeit Garcia, Katelyn Niebuhr, Evee Heether, Treydon Sedge, Miguel Torres, Tristan Bishop, Keirna Hayman, Joseph Briscoe, Dalton Kohl, and Alli Conger. Open or Closed? How do we decide? The decision about late starts or cancellations is made by gathering as much information as possible with multiple people putting their heads together. Two big concerns are whether bus drivers can safely travel the routes, and whether the grounds and maintenance crews will be able to make the parking lots and school grounds safe. During snow events such as we've been having, our head of maintenance is usually out pushing snow by about 3:00 AM. One of his jobs is to communicate (via radio or cell phone) with the transportation director and the superintendent to give reports on conditions. We also contact three bus drivers living in three different directions to get their input, plus check the national weather service and two specific local/micro climate reporting apps. The superintendent and transportation director will drive the roads themselves if there are questions that driving will answer. We also watch "flashalert" a local news app (closed system) that all the local schools and local news outlets use to track what other schools are doing (just to get an indicator). In addition, we network via phone with neighboring districts' transportation directors and superintendents. Criteria for closure include untreated or late developing ice on the roads, unplowed/untreated main roads with a snow build up of more than a couple of inches, and certainly roads that have snow on top of ice! (For us, "main roads" would be Highways 12 and 410, Old Naches Highway and South Naches Road plus their connectors - Allan, Eschbach, Mapleway, Galloway). Even though they are of concern, we cannot wait for the side roads to be plowed; we would NEVER have school then. When side roads are built up/problematic for buses, we call for "alternate snow routes" meaning we don't send buses up those roads for fear of accidents or getting stuck; that means that parents have to deliver their students to the highway or other main road. Really, each event becomes an educated guess because we have to make the decision hours away from the actual start of the school day. When in doubt, we call a two hour delay to give the plows and de-icers a chance to "catch up" and to buy a short window of extra time to see if conditions improve or deteriorate. And, because conditions are not uniform throughout the district or throughout the valley, we know that whatever the call we make, there WILL be detractors. Every. Single. Time. It's the nature of dealing with nature! On Wednesday Naches Valley had a day on the hill . 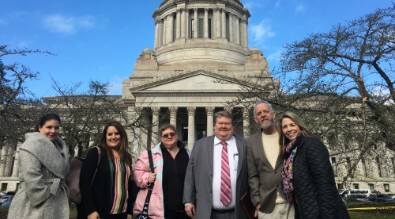 Jordan Kring, Renae Lacy, Todd Hilmes, Bill Razey, Marcie Carrell and Patti Hyatt traveled to Olympia to speak with legislators about the lack of funding from the "McCleary fix". There are two bills we are keeping an eye on. SB 5316 and SB 5466. If you would like to know more about these bills, go to https://app.leg.wa.gov/billinfo/. There is a school board meeting on Monday, February 25th at 7:00 pm at the district office. The agenda can be found at nvsd.org.